CMST are GOLD Award winners! 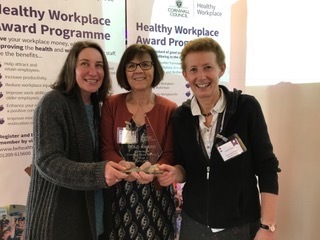 Our team of Healthy Workplace Champions, Christine Judge, Janet Elston and Karen Frost proudly received the GOLD Award at the Healthy Workplace Conference in Wadebridge on March 18th. This is an NHS programme that encourages good health in the workplace. Not just physical health, but mental health and well-being. You need good health to work, and work can give good health. So it matters to employers and employees to invest in Workplace Health. The programme has three levels of achievement, Bronze, Silver and Gold. Karen Frost says ...“We are thrilled to have received the GOLD Award today, and lovely to be recognised for all that we do for our staff, the information we share and the social activities we arrange”.